In 2009 bloggers, Cecelia and Bridgette, met at a blogging conference and decided to form a partnership, which would bring brands and bloggers together. Their goal was to help both brands and bloggers to be able to learn from one another in a mutually beneficial setting. I was thoroughly impressed with their professionalism and the fun nature of the conference. This was my second conference held by these Double Duty Divas and I definitely plan to attend more conferences held by them. The best part of the conference is that every year bloggers can attend their iRetreat to learn more information about the business aspect of blogging. What sets this conference apart from other blogging conferences is that it is a smaller conference, personable, and reasonably budgeted conferences. The sessions are also very informative but not overwhelming. The largest take away for attendees are real connections with other like-minded bloggers, and an opportunity to meet with a few really stellar brands and a chance to build effective partnerships. Although I have been blogging for 4 years, the advice and information I learned during the conference sessions helped me decide, which direction I should take for my business to best expand. Another key aspect of the conference is that attendees, like me, learn how to better monetize from people who are leading the way, whether it’s a blogger, PR firm representative, or brand employee. The topics of the sessions are obtained directly from the attendees themselves and help answer real questions we have about becoming our own CEO of our brands. The speakers appear to welcome connecting with their audience and are willing to provide additional answers to their questions and additional follow-up when needed. Organizing a well attended conference is extremely challenging, but Cecelia, Bridgette, and their team make the conference appear stress-free. If you’re looking for a conference that is not overwhelming, and also offers knowledge as well as fun and good networking opportunities, then iRetreat is a conference that I would suggest for you. 1. 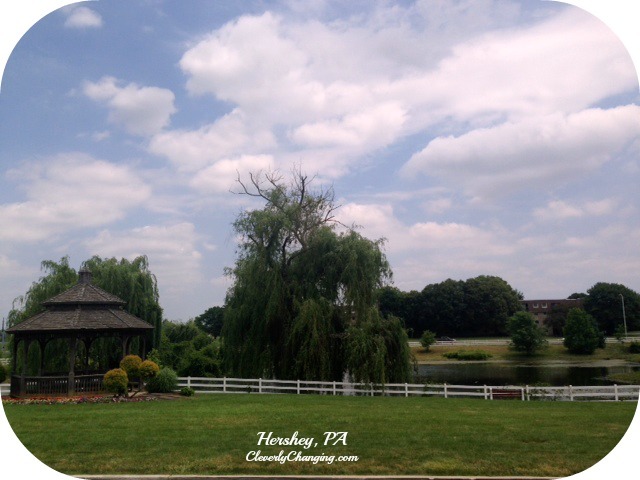 The iRetreat conference was held in Hershey, PA at Hershey Lodge, which is a family-friendly location. 2. Great sponsors. This year’s sponsors were phenomenal. 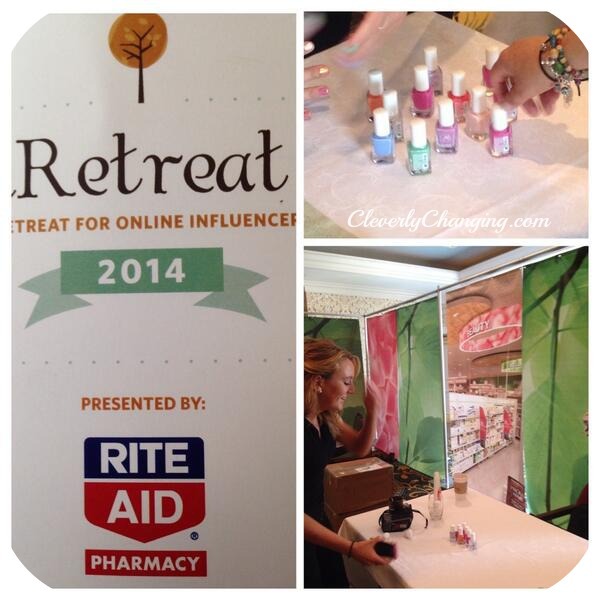 RiteAid did an excellent job of helping bloggers feel pampered by setting up a RiteAid Wellness lounge where attendees were able to receive manicures. Their panel discussion also provided attendees with a good overview of what brands are looking for when they work with bloggers. The top advice was to have a clean site, be professional, and provide lots of community engagement. Bricks4Kids – My kids absolutely loved the building toys they received. They were given Lincoln Logs and k’nex blocks. These blocks offer a great alternative to video games, so we are very happy these blocks were a part of the iRetreat2014 swag. 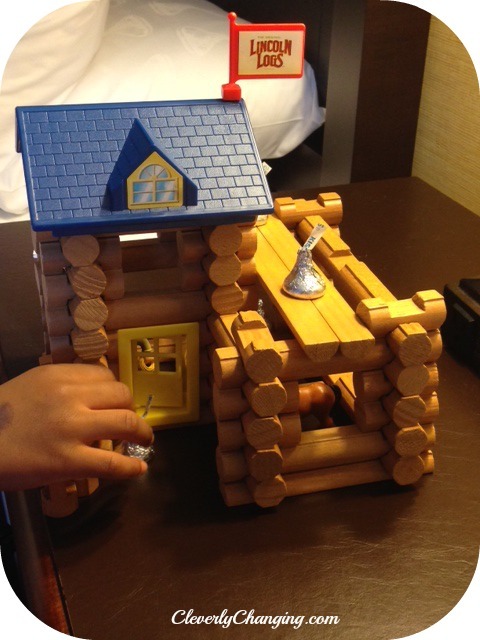 Here’s one picture of a log cabin my kids were so excited to make. 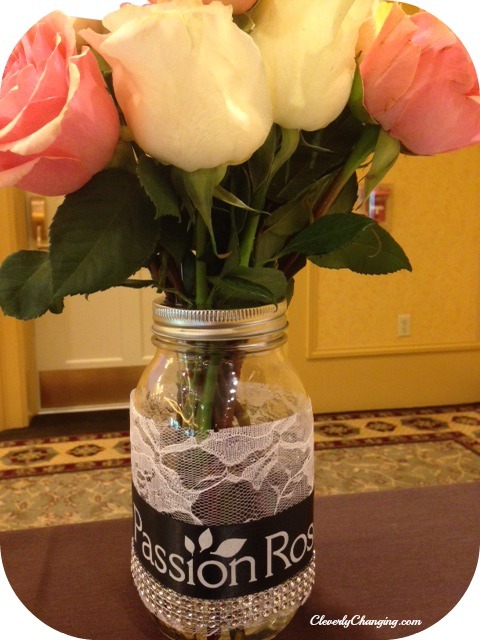 Passion Roses – Everyday, there were fresh beautiful flowers that decorated the ambiance. 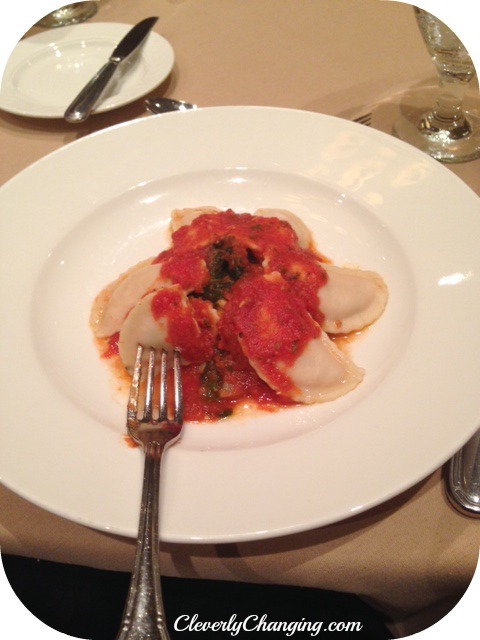 Musselman and Lucky Leaf – Sponsored lunch on the 2nd day of the Conference. I loved my vegetarian option. Visit Hershey and Harrisburg were kind enough to offer bloggers media passes to other local attractions in the area such as Hershey Gardens, Hershey Story, The Museum on Chocolate Avenue, The National Civil War Museum, Fort Hunter Mansion and Park, Pride of the Susquehanna Riverboat and many more attractions in Hershey PA and Harrisburg. Pampers helped supply tasty snacks and diapers. Jabra – A representative from Jabra shared many of their great products with us and also provided me with a giveaway for my readers so stay tuned. On Thursday, I will post the new giveaway. 3. Top speakers. The keynotes this year were Vera Sweeney and Audrey McClelland. Their partnership and commitment to “passion first” surprised and inspired me. 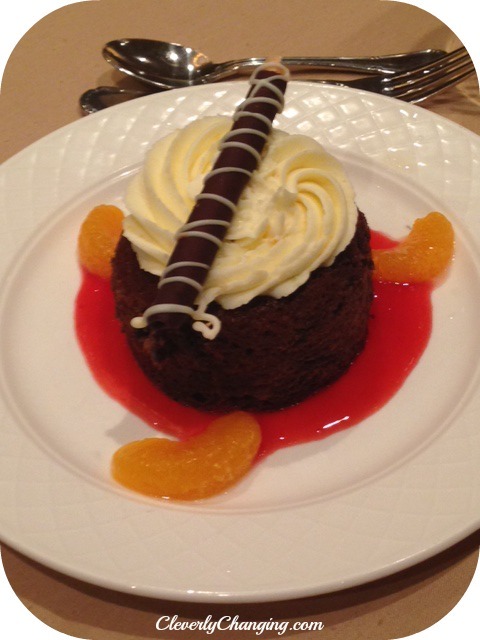 I met many fabulous new bloggers that I plan to keep in touch with and develop new relationships.